Mansfield Town striker Adi Yussuf could be in hot water with the FA after Plymouth Argyle fans claimed he urinated in full view of the disabled supporters section before going on as a substitute at Home Park on Saturday. Fans complained to stewards about the 23-year-old’s actions after he was allegedly seen relieving himself on a piece of disused land between the disabled zone and the Devonport End. The stewards in turn reported the fans’ complaints to match referee Brendan Malone, who included the incident in his match report. The Football League referees department then forwarded the allegations on to the Football Association who are now investigating. Yussuf came off the bench in the 54th minute of Saturday’s game, replacing Chris Beardsley in the 3-0 defeat. An Argyle supporter, who wished to remain anonymous, told the Plymouth Herald: “During the first half of the match Mansfield substitute Adi Yussuf was warming up on the touchline right in front of the disabled zone (where I sit with my friend). 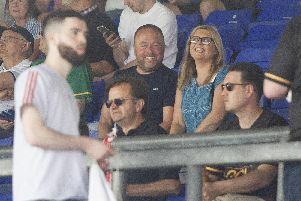 “He said something to Plymouth Argyle substitutes (Louis) Rooney and (Ben) Purrington before walking over to the piece of disused land between the disabled zone and the Devonport End and took a wee. “This was right in front of everyone in the disabled section. “Myself and the lady who works in the refreshments area witnessed it as well as some others and we reported it to the stewards. A Plymouth Argyle spokesperson added: “We were asked for our observations by the FA on an incident during our game against Mansfield that was included in the referee’s report.